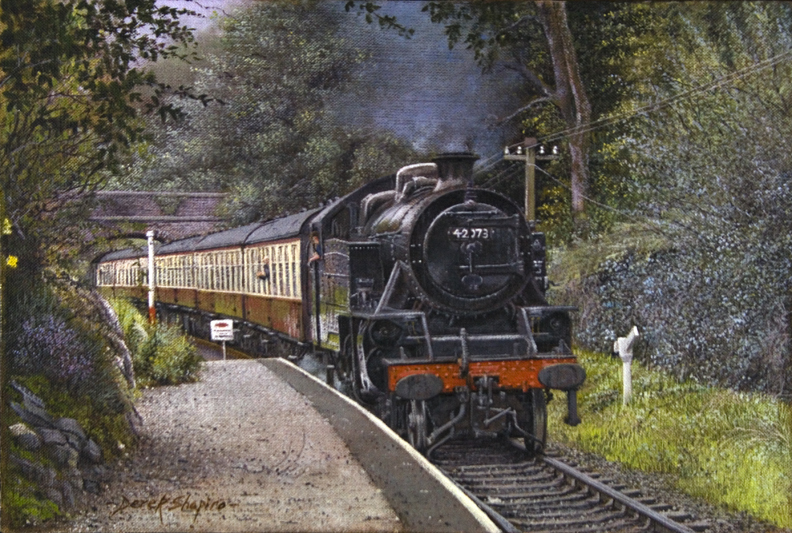 42073 class, BR Fairburn pulls in at Newby Bridge railway station. This steam engine is from the Lakeside Haverthwaite heritage railway and the train stops at Lakeside station where you can board a boat on Lake Windermere. I took in Newby Bridge on a walk I did along a stretch of the River Leven, the bridge is situated on the southern end of Lake Windermere and after a coffee at the hotel set off from the station where I was lucky enough to see the train passing through the station. 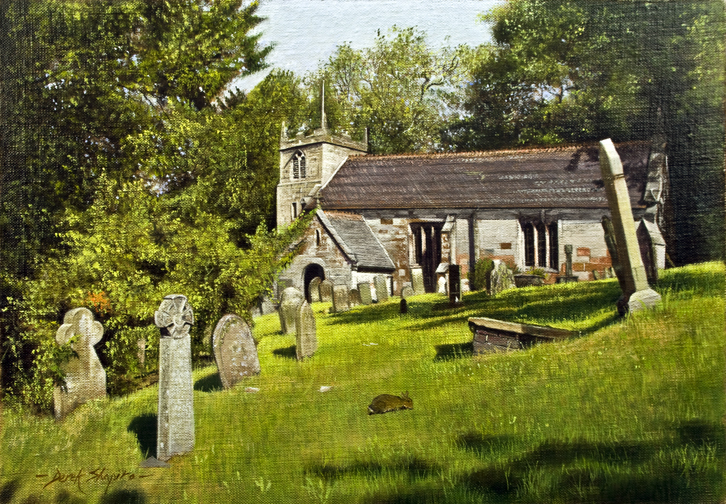 After starting the first painting of St Peters church http://wp.me/p2Ijh6-Yw, I was commissioned to do this second picture. By coincidence the client came into the gallery shortly after I started the first painting. He too got married at the church and was visiting his wife who is buried there. As explained in the first painting of St.Peters, Charles Darwin, the father of evolution married there, after marrying Joshia Wedgwood’s daughter, who used to live in Maer Hall which is opposite the church. Some years ago I was commissioned to paint Maer Hall by the present owner, since Darwin’s days, the Hall has been reduced considerably in size. If you would like to commission a painting,on any subject, then please click here and get in touch. 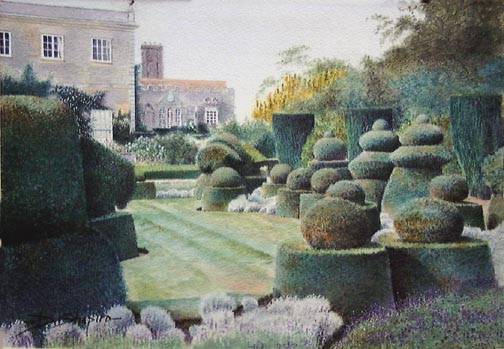 This pair of pictures were painted in the Victorian style of water colour painting and the topiary set out on the lawn represents a chess set. 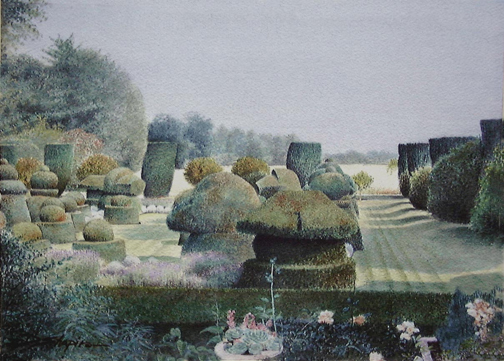 In painting two, the lawn finishes and looks over a ha-ha into the distant fields. A ha-ha is a recessed landscape design element that creates a vertical barrier while preserving views, as well as preventing access to a garden by grazing livestock, without obstructing views. 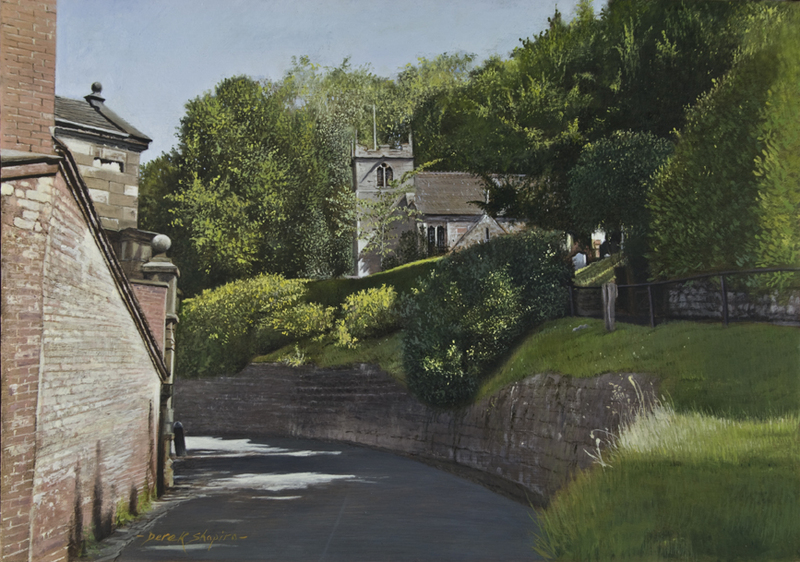 St Peter’s church, is situated in a small rural village close to my gallery. The painting was commissioned by a lovely couple, who sometime ago, got married in the church. “Its main feature is the large 17th-century stone-built country house, Maer Hall, built on a slope above a small lake, or “mere”, which gave the house and estate its name. The Hall became the home of Josiah Wedgwood II and was frequently visited by his nephew Charles Darwin, who went on to marry Josiah’s daughter Emma at St. Peter’s Church, which stands higher on the hillside, close to the Hall. When she was young, Emma helped her older sister Elizabeth with the Sunday School, which was held in Maer Hall laundry, giving sixty village children their only formal training in reading, writing and religion. The grave of Josiah Wedgwood II and his wife Elizabeth in the churchyard has a view down over the Hall”. Whilst living in Exeter for a spell, I used to hang about in the Cathedral and roam the City streets. I came across this courtyard house, set in the Bishops Mews, and was struck by the shaft of sunlight that pierced part of the courtyard and house. 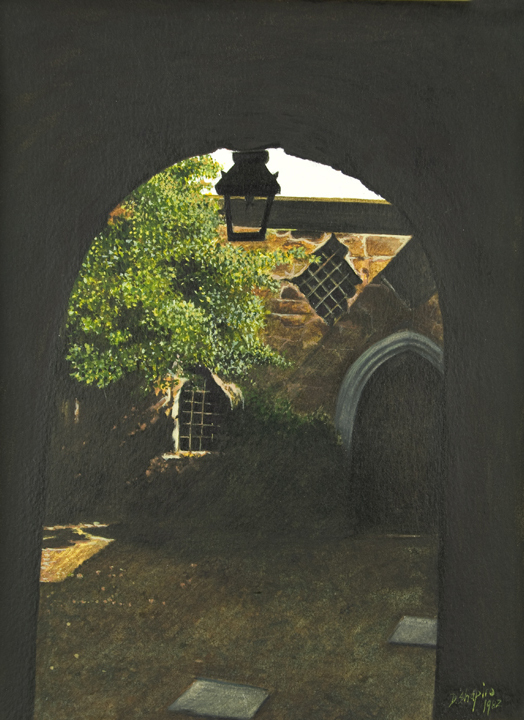 The street side of the house was in shadow, as I looked through the archway into the courtyard, for an instance was blinded by the light, and for a few seconds, until the eyes adjusted, the archway was in blackness. It was a real challenge to depict this moment in time and impossible to paint the shaft of light bright enough. If you get the chance, pay a visit to the Alhambra, a beautiful palace set in the hills in Granada Spain. The Alhambra was a real walled city, built by the Nasrid Kings in the last period of Muslim rule in Spain. 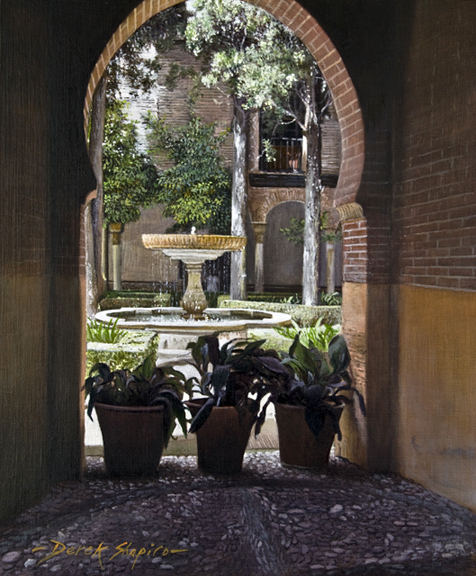 You could spend a lifetime painting scenes of the many entrances and secluded courtyards set within the palace, as well as unending views and sections set within the palace walls. I was struck by this view of the Lindaraja Courtyard, depicted in the above painting, and this courtyard alone could have made me work for at least a dozen or more paintings. 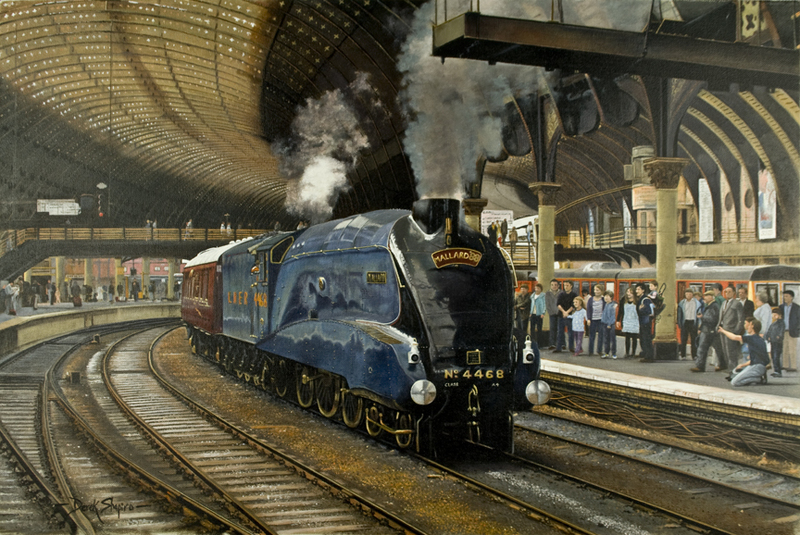 The Mallard, the world’s fastest steam engine passing through York Station. Seen in 1988 when it took part in commemorations. Whilst out walking with an old friend, in late summer last year, we happened across this scene in a remote part of the Shropshire country side. Scenes like this are hard to find and make good subjects for a painting. As often is the case, it is the simplistic things that we give no thought to that make for the best paintings. Every picture tells a story, this one to me conveys the message, as the title of the painting ‘Retired’ suggests, something that has lived out it’s time and usefulness and no longer required. Also the run down and overgrown condition of the lean too, where the tractor is housed, perhaps an indication that the farmer has seen better times and is now, as our economy is, suffering austere times. 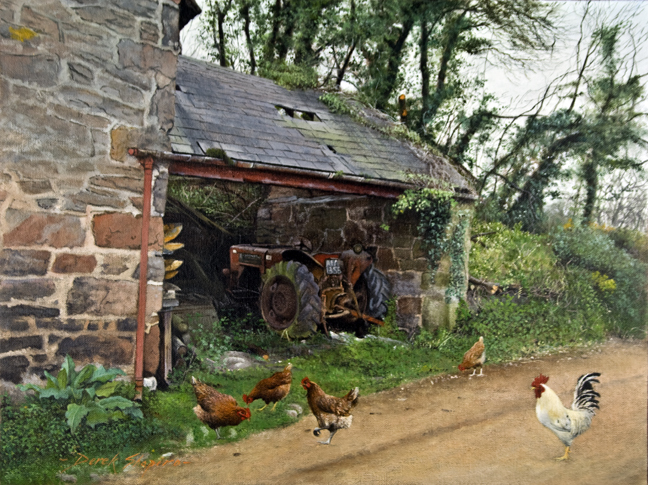 This scene is as is, apart from the dirt lane, I don’t much like tarmac in paintings, and the chickens were added as an afterthought. 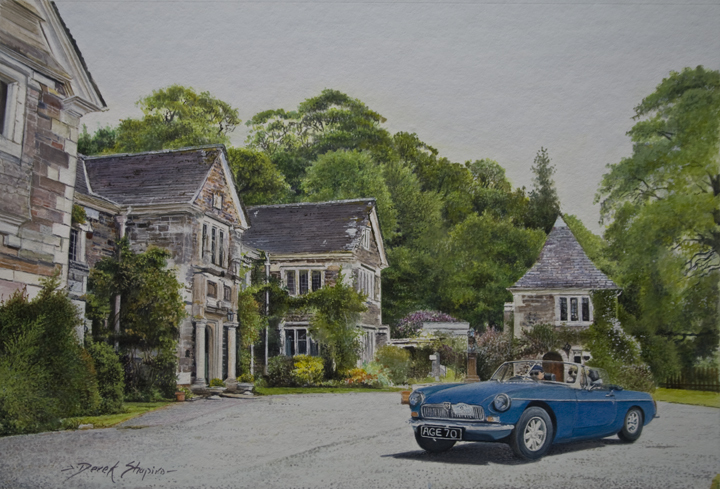 ‘Classic Day Out’ is a water colour of Alan Davis, in his cherished MGB Roadster leaving Lewtrenchard Manor. Alan’s daughter, Catherine, commissioned me to do this painting. Alan now retired, has been in the motoring trade for 47 years, 30 of which were at the helm of his own business. He has completed many restoration’s of old MG’s and has been a member of the MG Club for over 40 years. Although I have never met Alan, through this painting I feel that I have got to know him partially. Alan used Lewtrenchard Manor the backdrop to the painting, for business events as well as personal occasions, the occasion this time, as the number plate say’s his 70th birthday. What a surprise.